I evacuated from New Orleans around 10 p.m. on August 27, 2005. On that Monday, while the storm was making landfall along Pearl River, I stood watching the waves from Wolf Bay crash against the pine trees in my parent’s backyard. I was almost two hundred miles from the epicenter of the storm and there were still tropical force winds and storm surge. I had only taken supplies for three days and I fully expected to be back in the City that Care Forgot by the end of the week. It was not that easy and it wasn’t until a month later that my neighborhood was finally cleared for re-entry. I was stoked at my first view of my home. The only hurricane damage was from my neighbor’s tree falling on my roof. It took out a chimney and tore through some shingles but, with a blue tarp, I could have been back in my home in no time. The real damage, however, came from the broken levees. The water didn’t rise all that high in my neighborhood, as you can see with my Dad and his measuring tape, pointing at the high water mark. With my house on three-foot risers, I only had a couple of feet of water in the house. The problem was the water had no where to go. As you can see from the discoloration on the fence, because those flood waters didn’t recede for days what was wood collapsed, what was metal rusted, and what was left was covered in mold. I kept it together as we entered the house, although I gagged into my mask at the smell. The colorful mold already stretched ten feet high and there were maggots on the outside of my refrigerator, warning me of what to expect inside. As I entered my library, I lost it. 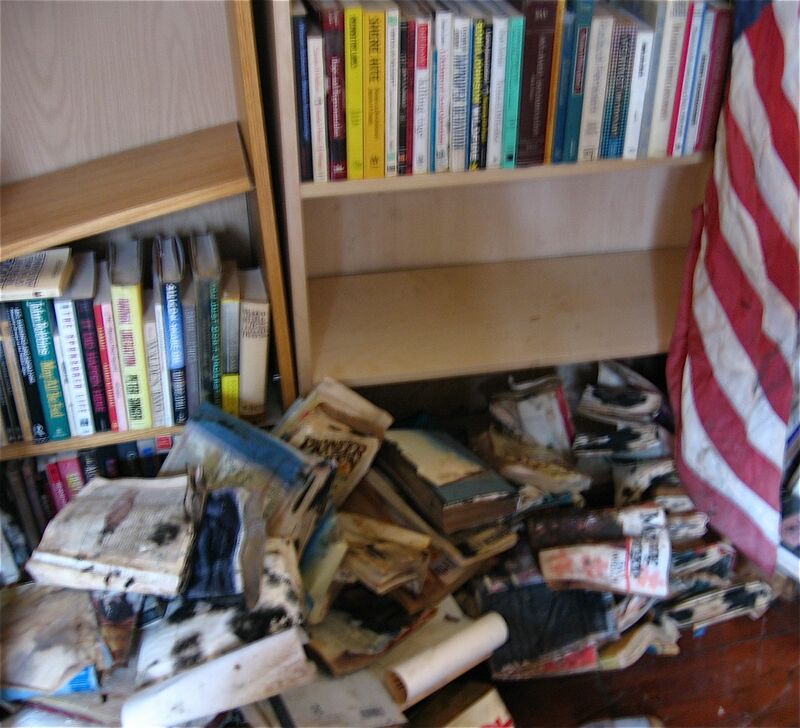 The bookcases that hadn’t melted from the water (most were from IKEA and made with MDF), had the bottom shelf of books expand as they absorbed the water to crack the case and cause the upper shelves to fall. 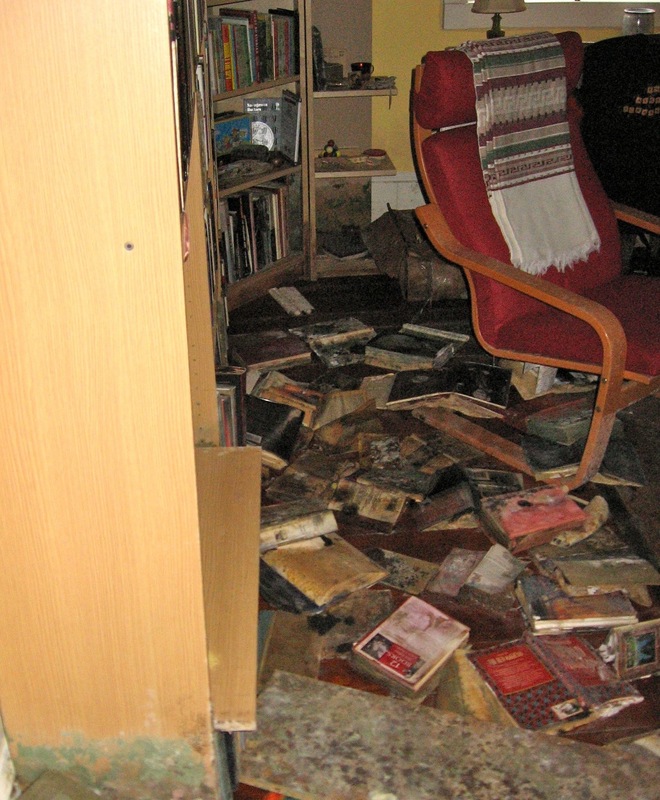 The loss of the books broke my heart in ways I can’t explain to folks whose lives don’t revolve around books. I spent over ten years working in bookstores but I had been a lifelong reader and collector of books before my first day of work at Border Book Shop in Rockville, Maryland. They were my friends, most read and reread and as comfortable to me as an old shoe. I marked my travels and the passage of time by my books. I remembered places I had visited by the bookstores I went to see. I knew where each book had come from and I could tell you what had been going on in my life when I first read them. Those books might only have been a small part of my losses and paled in comparison to what others had lost but I still keenly feel their absence even today. It is eight years later and we’ve come a long way as a people and a city. There are still major issues and you can check out the Katrina Pain Index for a detailed look at some of them. Even with all her problems, I still love this town and the resiliency of her people. I am also very grateful for the people who supported me through the storm and the aftermath. I wouldn’t have made it without my friends, my family and those strangers who opened their hearts and their arms to me. With their help, I’ve rebuilt my life and my home. I did have some repair work when Hurricane Isaac hit last year but those four days without electricity were more inconvenience than calamity, especially when it got too dark to read. What we need to remember on this anniversary is that, while the Gulf Coast is vulnerable to weather events, much of the problems from Katrina were from levees and canal walls in and around the city failing well below their design capacity. We should not allow history be rewritten to ignore the role of the Army Corp of Engineers in the catastrophic flooding or the incompetent Federal response in the aftermath (as is happening at the George Bush Museum). What was true then, has been true these past eight years. In the Midst of Tribulation Now Available! My newest book has now been released. In the Midst of Tribulation is available as a paperback and an ebook! Long suspicious that the world was going to go up in flames, Jay has retreated to remote Northern California and lived off the grid for years. She didn’t want to be right—but she was. When the war ended, it was clear nobody had won. Susan knows only one place where she and her extended family might be safe: with Jay, her ex. Desperate and frightened, the refugees rely heavily on their friend Piper, who agrees to make the journey with them. After a ragged reunion, Jay is willing to take in the newcomers, but the only way they will survive on the land is if they all work and sacrifice. It is easier said than done, especially when old feelings—and new ones—break the fragile peace and threaten them all. Order it now from Bella Books! Here is a teaser to whet your appetite! And, for those who order the digital book (or just want to have it), I’m registered at Authorgraph and will be happy to put a personal inscription in your copy! Go to Authorgraph now!